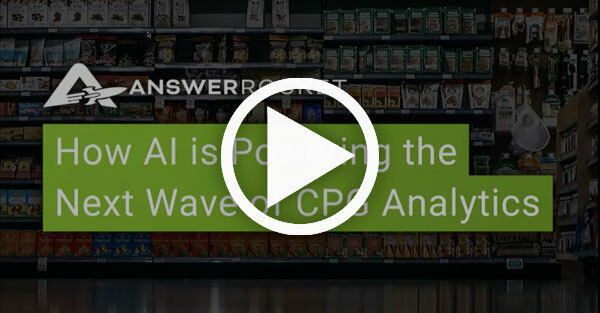 In Part II of our AI for CPG webinar series, our Chief Scientist Mike Finley shared the latest features our self-service analytics product. For instance, our Fact Sheet takes your business’s variables – brand, channel, market, volume, penetration, market share, and more – and within seconds highlights the largest contributors and detractors to your bottom line. Pete Reilly, SVP of Sales and Marketing, explained why this type of analysis is groundbreaking. Imagine a brand manager who is curious about the performance of five products in eight markets. When you factor in all of the possible variables that could be studied, that is the equivalent of 511,000 unique queries. AnswerRocket is able to run that analysis within seconds. He continued: “The human can then make another series of decisions to choose another launching point to go deeper. And again we launch that deeper analysis using all the power tools, using all the varieties and permutations and referring to some of those hundreds of thousands of options laid out. During the Q&A portion of the webinar, a student from San Jose State University asked about the future employment prospects of analysts. Pete assured the student that their skills would be even further leveraged with an augmented analytics approach. “There’s a lot of analysts in companies answering fairly basic questions and trying to get those back to the business,” Pete said. “So what ends up happening is we run into data science teams who they’re not actually doing data science. They’re actually running very basic SQL queries. “What happens is, the business gets frustrated because they can’t get the answers to those questions quickly. The data science team gets frustrated, because they’re not actually doing data science work. In other words, a solution like AnswerRocket works, because your business users get the results and information they need in an efficient manner and your analysts are free to start investigating higher-level forward-thinking questions.